Jakarta (AFP) – All 189 passengers and crew aboard a crashed Indonesian Lion Air jet were “likely” killed in the accident, the search and rescue agency said Monday, as it announced it had found human remains. The Boeing-737 MAX, which went into service just months ago, vanished from radar 13 minutes after taking off from Jakarta, plunging into the Java Sea moments after it had asked to be allowed to return to the Indonesian capital. Websites that display flight data showed the plane speeding up as it suddenly lost altitude in the minutes before it disappeared. Some 40 divers are part of about 150 personnel at the scene, authorities said, with the plane in water about 30 to 40 metres deep. 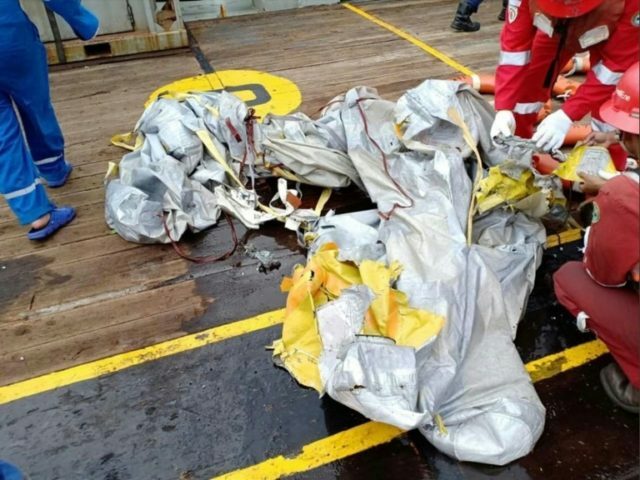 Earlier, video footage apparently filmed at the scene of the crash showed a slick of fuel on the surface of the water and pictures showed what appeared to be an emergency slide and bits of wreckage bearing Lion Air’s logo. The carrier acknowledged that the jet had previously been grounded for unspecified repairs. It was not yet known if there were any foreigners on board. Images filmed at Pangkal Pinang’s main airport showed families of passengers crying and hugging each other, with some yelling “Oh God”. “This morning he called asking about our youngest son,” said a sobbing Ermayati, referring to her 45-year-old husband Muhammed Syafii, who was on board. Among them were half a dozen colleagues of Sony Setiawan, who was supposed to be on the flight but missed check in due to bad traffic. “I know my friends were on that flight,” he told AFP. Setiawan said he was only informed about his lucky escape after he arrived in Pangkal Pinang on another flight at 9:40am. The pilot and co-pilot had more than 11,000 hours of flying time between them and had recent medical checkups and drug testing, it added. Lion Air CEO Edward Sirait said the plane had an unspecified technical issue fixed in Bali before it was flown back to Jakarta. “Engineers in Jakarta received notes and did another repair before it took off” on Monday, Edward Sirait told AFP, calling it “normal procedure”. Boeing, just days out from its first commercial delivery of the 737 MAX in May last year, reportedly suspended its release due to an engine issue, according to airline safety and product review site airlineratings.com. It said the engines were a product of a joint venture between US-based General Electric and France’s Safran Aircraft Engines. Earlier this year, Lion Air announced it was buying 50 Boeing 737 MAX 10 jets for $6.24 billion. Indonesia’s air travel industry is booming, with the number of domestic passengers growing significantly over the past decade, but it has acquired a reputation for poor regulation and its airlines had once been banned from US and European airspace. In August 2015, a commercial passenger aircraft operated by Indonesian carrier Trigana crashed in Papua due to bad weather, killing all 54 people on board. In 2014, poor maintenance and the pilots’ inadequate response was blamed for the crash of an AirAsia plane crashed with the loss of 162 lives.